I am always so humbled when a client hires my talent and passion for an amazing venue. Just the honor of capturing their wedding day is pretty awesome, but when you have a venue like Spring Island, South Carolina, then that is another bonus. In South Carolina fabled Lowcountry, lies Spring Island, South Carolina, 3000-acre nature backdrop, and live oak forest, with elegant private preserve and waterfront homes. With all of that you have a 31 acres award winning golf and equestrian complex, now the best part of this amazing place and very secluded is the Old Tabby Ruins, most wedding clients love this place it is the perfect backdrop for their ceremony, these ruins have been there for a very long time and they are very well preserved. When I did a walk threw with my clients on the property, I was so amazed of what backdrop these Ruins would produce in my wedding photography. The day came and this is how I got so many amazing wedding images, this one in particular is breathtaking, because again you have to respect the ceremony and capture it all as if you were a fly on the wall, being unobtrusive is key to a ceremony. As you can very well see, I used the Old Tabby Ruins as a frame yet leaving the rusty rock alone, I waited a little while for the bride to smile, and look at her now husband. This images is why going out of your comfort zone, getting into a squat position, keeping quiet and getting the image photographed in a timely fashion, is why I have mastered my craft. 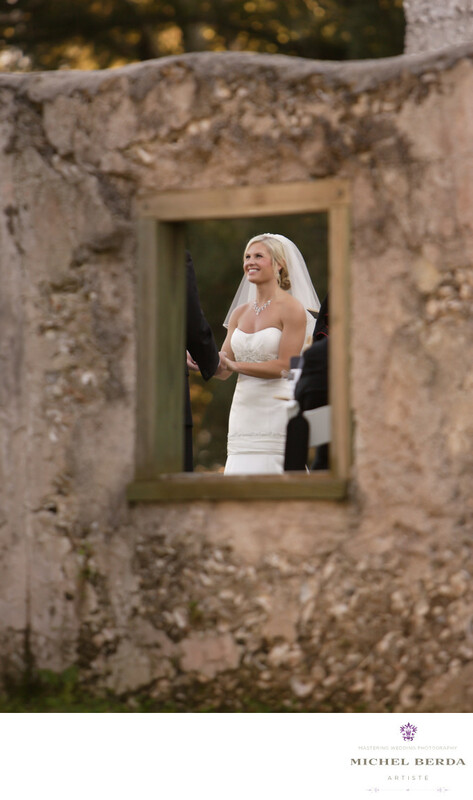 I am so grateful for my clients through the years and for letting me capture amazing wedding images like this for them.Keywords: Spring Island South Carolina (3).